The activity was organized as Soroptimists here joined others across the region in observance of the first Saturday of March, a day on which members are called to service. 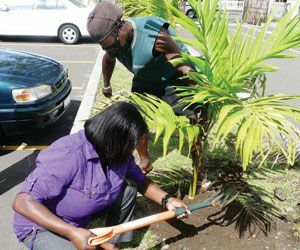 Annelle Thomas, Public Relations Officer (PRO), explained that the day of service was suggested by the regionâs president Kathy Greenidge, who suggested that the club do something for the environment. âSo we decided it would be a good opportunity to do this,â Thomas said. Planting trees enhances the surroundings and contributes to a healthier environment, Nelcia Primus, Programme Action Officer, told SEARCHLIGHT. She added that the idea was something that had been in the works ever since the library was constructed. She was of the opinion that not enough is being done to beautify the town and this was the clubâs contribution towards this project. âWe thought we could do something to beautify the compound especially seeing that it is located in Kingstown,â Primus said. The project was done in conjunction with the Forestry Division Primus said. The work done by Soroptimist International, according to Primus, is done under six focal areas, including health, international goodwill and understanding, economic and social welfare, status of women and the environment.